Take the complication and expense out of maintaining a leak free boat by choosing PSS Shaft Seals to meet your boating needs. These durable seal shafts can keep water out of the bilge and are resistant to corrosion and the obvious wear and tear from exposure to salt water. PSS Shaft Seals create an air- and watertight connection to keep water out of your bilge and keep your boat running in tip top condition, all with very little effort and maintenance on your part. What is a PSS Shaft Seal? The PSS Shaft Seal, or Packless Sealing System, is a part that ensures that your boat will be airtight and thus free of leaks. Quite simply put, a PSS Shaft Seal is a seal that lies against the flat surfaces of the rotating steel rotor and the carbon flange. This seal is so ingenious and cost saving because it is low maintenance, requiring little or no additional work once it’s installed. These seals are resistant to salt water, UV radiation and corrosion. Essentially, the only requirement for the management of the PSS Shaft Seal is that it be checked periodically to ensure that it is operating properly. Check ups ensure that the performance of the seal is not being degraded by age and wear and tear. Other than the periodic check up, no other maintenance is required. The beauty of PSS Shaft Seals is that they operate virtually maintenance free. The cost of maintaining a boat can be staggering, especially if the vessel suffers from frequent leaks that require constant maintenance and the replacement of costly parts. 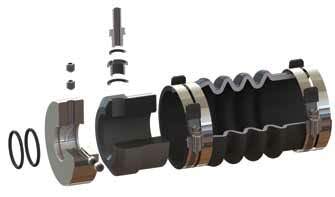 The PSS Shaft Seal drastically reduces the need for maintenance. Suggested replacement is every 6 years. The introduction of such a crucial mechanism, one that is virtually maintenance free and allows a 6 year respite from costly repairs, could save you thousands of dollars in maintenance costs. It just doesn’t get any easier than that. Another advantage to PSS Shaft Seals is that there are maintenance kits available and tutorials to help you both install and maintain your PSS Shaft Seal if you happen to be a do-it-yourself enthusiast. The seal shafts’ resistance to high temperatures ensures that the compression needed to compensate for misalignment and vibration is maintained so that the contact is kept between the faces. The entire construction of the PSS Shaft Seal is designed to consistently keep water out and maintain airtight, constant contact between the faces. The O rings on the recessed collar rotate, but experience no wear or stress that will degrade performance. The PSS Shaft Seal is designed to work in your boat without costly maintenance, which increases the stability of this powerful mechanism and makes for a wise investment for any serious boat owner. This results in the benefit of the inherent savings you as a boat owner will experience by being able to forego the typical routine maintenance often associated with keeping your boat free of leaks. With a part this good, you can’t afford not to invest in one!